This debate is between Atheist Philosophy professor Dan Flores of HCC and local Christian apologist Eric Hernandez. 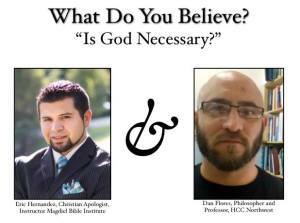 The topic is not merely does God exist but rather a much deeper and philosophically pertinent one: “Is God Necessary”. It could very well be that God does not exist, it could be that He does exist, or it could be that even if He did He wouldn’t be needed and nothing would be different. After listening to these two men present their case for their positions you can judge for yourself what you think the answer to this question should be.